Five more CoMMpass abstracts were presented today. The MMRF’s Dr. Daniel Auclair presented his research on myeloma patient treatment preferences at relapse (ABSTRACT 614 https://ash.confex.com/ash/2018/webprogram/Paper113087.html). Ninety-four patients were surveyed about features of treatment such as length of time before disease progression, risks of serious side effects (such as heart failure, peripheral neuropathy, low blood counts, gastrointestinal problems), and the mode and frequency of treatment administration (such as daily or weekly pills, weekly injections, IV infusions). Dr. Auclair was able to tease out 2 different subgroups of survey participants with different preferences. Subgroup 1 placed the greatest importance on avoiding toxicities—specifically avoiding peripheral neuropathy. Subgroup 2 valued a longer time to disease progression. Further analysis on preferences showed that kidney complications and low white blood cell counts were the most bothersome treatment characteristics and taking oral medication (once a week or daily) were the least bothersome. As our understanding of patient preferences surrounding treatment the MMRF will be able to help decision makers improve the quality of patient-centered care. The first opportunity to develop a drug specific for patients who harbor the chromosome deletion 17, a high-risk disease feature. Data from the CoMMpass study showed that patients with the chromosome deletion 17 also had a reduced expression of a certain gene called POLR2A—a gene that codes for a protein involved in DNA replication. Patients with both the deletion and low expression of the POLR2A gene have a poor prognosis, but may have a therapeutic sensitivity to a drug—α-amanitin—that inhibits the protein. 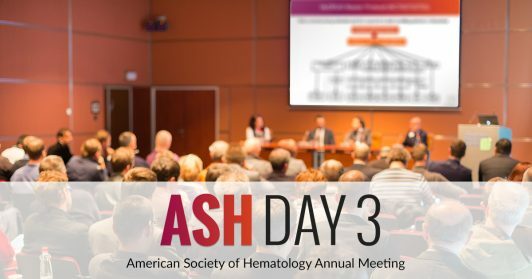 Investigators at MD Anderson Cancer center investigated the use of a new B-cell maturation antigen (BCMA)-targeted antibody amanitin conjugate called HDP101 to see its effects in myeloma cells with chromosome deletion 17 (ABSTRACT 593 https://ash.confex.com/ash/2018/webprogram/Paper118412.html). The results showed that HPD101 was potent against myeloma cells and specific for the chromosome deletion 17 cells. The identification of a new cancer entity called clonal hematopoiesis of indeterminate potential (CHIP) in up to 22% of myeloma cases. Investigators showed that myeloma patients who exhibit CHIP have worse outcomes that those who don’t but the use of maintenance therapy with an immunomodulatory drug (like Revlimid) improves the outcome of patients with CHIP (ABSTRACT 749 https://ash.confex.com/ash/2018/webprogram/Paper113059.html). A gene commonly mutated in myeloma—MCL1—may alter responses to an emerging class of inhibitors that are in clinical trials. Dr. Brandon Chen of Emory University showed that mutations in the MCL1 gene confers resistance to existing MCL1 inhibitors (ABSTRACT 951 https://ash.confex.com/ash/2018/webprogram/Paper113444.html). A new potential therapeutic target to interfere with myeloma cell survival and expansion outside the bone marrow. The team at Emory University identified a protein involved in myeloma cell survival called syntenin-1 that when highly expressed is associated with a poor outcome (ABSTRACT 1008 https://ash.confex.com/ash/2018/webprogram/Paper113594.html). The expression of syntenin-1 is correlated with a myeloma cell surface protein called CD86 and this protein is necessary for myeloma cell survival. Therefore, if syntenin-1 can be inhibited it will thereby reduce the expression of CD86 on myeloma cells making them unable to survive. Syntenin-1 may be an attractive target for therapeutic treatment of myeloma. The MMRF is committed to advancing promising findings from the CoMMpass Study that could improve patient outcomes to the clinic. We will continue to keep you updated as these programs progress!